Yesterday, we announced that the 2014 BrooklynVegan official nighttime SXSW showcase will take place on Wednesday, March 12 at Red 7 Patio (611 E. 7th St. in Austin, TX). The punk-oriented lineup features Against Me!, Touche Amore, The Front Bottoms, Cheap Girls, Frameworks, Placeholder and a 7:30 special guest opening set by occasional actor and cult singer Harvey Sid Fisher. Doors are at 7 PM and headliners Against Me! go on at 1 AM. SXSW badges are welcome, and we’ll also have some general admission tickets for sale at the door (come early!). 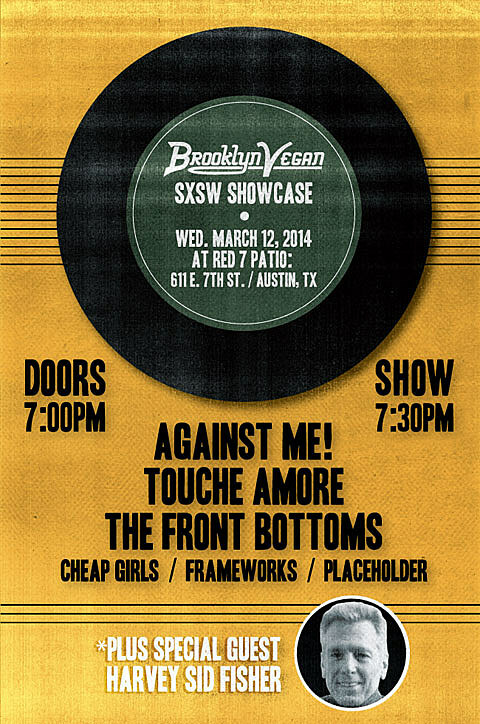 The Red 7 show is one of a few BrooklynVegan events at SXSW this year. Our metal blog Invisible Oranges will be announcing a metal showcase soon. We also have three day parties at Red 7 (3/13-15, lineups coming soon), and a BrooklynVegan/BV Austin-curated portion of the Flatstock stage on 3/15 with Austin artists Mother Falcon, S U R V I V E, and Bronze Whale.